Orthopedic massage is a specific type of massage that focuses on treating painful conditions that affect the soft tissue of the body. Do you have a special event coming up? Are you with a business that wants improve employee health? Are you unable to leave your residence for any reason? With on site massage we will come to you!! Rates vary, please call 515-222-1577. 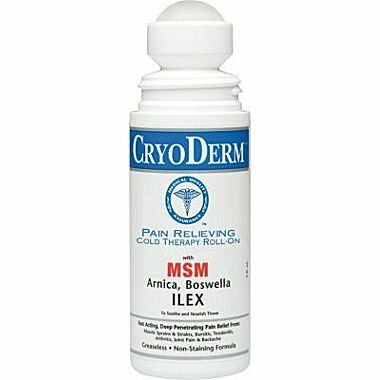 CryoDerm pain relieving Roll-On is the one used across the USA by chiropractors, massage therapists, physical therapists and sports teams to help relieve muscle and joint pain. It goes on cool and then almost creates a "mask" helping to block the pain. Fast acting, deep penetrating.Long Lasting cold sensation.Pain relief for muscle sprains, strains, stiff sore muscles, arthritis, joint pain, and more.Natural ingredients: MSN, Arnica, Boswella, Eucalyptus, ILEX, Menthol, Peppermint Oil. CryoDerm has become the favorite topical analgesic amongst arthritis back pain sufferers because it works fast and provides soothing relief. Please understand that this is powerful, yet temporary relief and will not cure your ailment. But, neither does pain medication. CryoDerm pain relief spray or roll-on is a natural way to achieve relief without taking harmful pain medication. To schedule an appointment give us a call or just click to schedule online. Or, if you have any questions about services or products please call 515-222-1577 to speak with Matt directly.